Well, we did it, number 750 at Duff's and it was a blast. We got cranking at about 4:00 P.M. on the outside deck with beers. Then the party supplies arrived via hearse. The action then moved inside a bit where Bar Man got pointers on making an excellent margarita from Miki, our bartender. 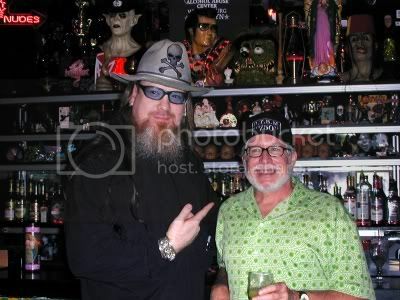 Then "The Man" himself, Jimmy Duff, showed up to crank up the action a notch or two. My brother-in-law Jim, the guy who started me off on this long trek way back on New Years day arrived too. 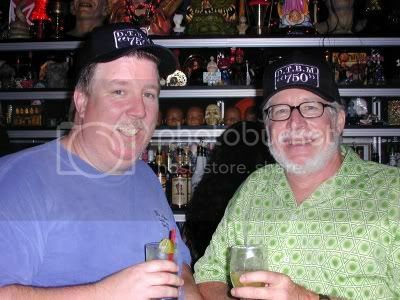 And Larry, the guy who cranked out the Associated Press article at the number 500 celebration showed up too, but only to party. Mr. Duff also ordered special D.T.B.M. 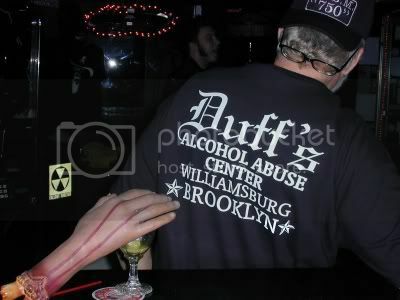 (Dan The Bar Man) caps and generously gave me one of his coveted Duff's Alcohol Abuse Center shirts. 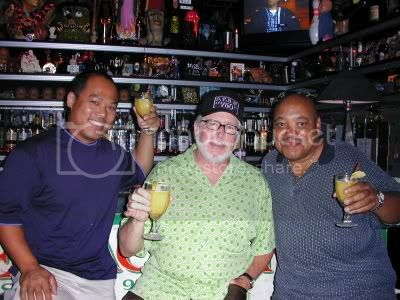 Well, needless to say, a great time was had by all and I am sure the partying continued well after Bar Man toddled off home after way too many margaritas. Only one for the day, but what did you expect? I am taking some time off now because my nephew will be visiting for a bit and he is a bit too young to join the Junior Bar Man auxilliary. Next week I shall be back at it again though, so see you then. Ah, a day off to rest up before bar number 750. 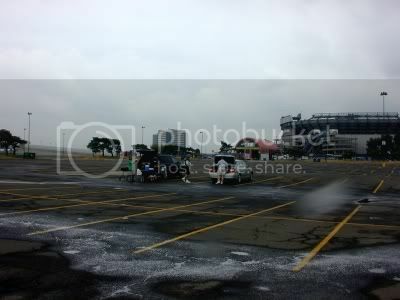 So what better way to do that than to get to Giants Stadium at about 2:00 P.M. so you will have ample time to tailgate before the Jets play the Vikings at 8:00 P.M. A six hour stint is just about right, and you don't have to worry about finding a parking spot, or even paying for parking, for that matter. Needless to say we waste no time preparing to prepare. Of course, I don't want to imply that there wasn't anyone else in the parking lot, we did draw quite a crowd. 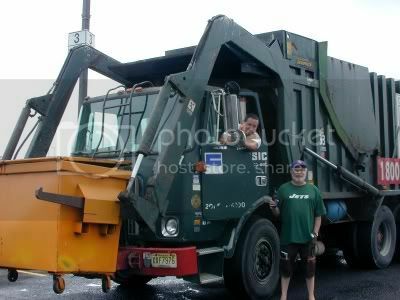 He was just delivering the dumpster for our empties. The Porta-Potty man showed up a bit later. We have all the comforts of home. 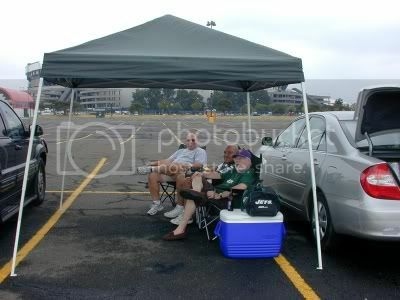 Once we got the tent set up we did get a couple of visits from the Parking Patrol who told us we were only entitiled to one parking spot per car. You can see how crowded it was and how we were depriving others of a place to park. Actually they were pretty decent about it, simply telling us that their boss sent them over. They didn't actually make us move though, so we just settled ourselves in for the long haul. 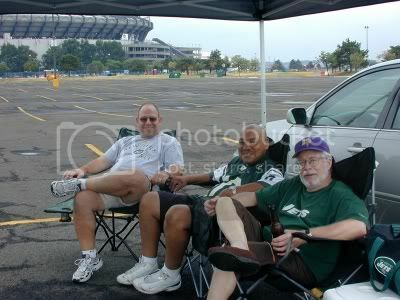 Being from Minnesota I wore a Vikings hat and a Jets shirt, but I put my money on the Jets. Sorry Bob (Minnesota Bob, not Jets Bob), you owe me a tener. The Jets won 28 to 21 in a sloppy game, as most pre-season games tend to be. We had sangria (my new specialty, the rum gives it a kick) and beer, sausages and muffulettas (a sandwich I first tasted in New Orleans, and one to die for). Not quite up to our usual fare (chili, egg and bacon sandwiches, roast turkeys, baked zitti, sweet potatos with rum soaked raisins (another of my specialties) and much more), but a damn good pre-season warm-up and, kind of like stretching before exercising, a good preparation for Bar Number 750. Only needed three more bars to set the stage for Saturday’s Celebration and I decided I would knock them off today, take a rest tomorrow, then go the Jets game on Friday and tailgate my tail off. 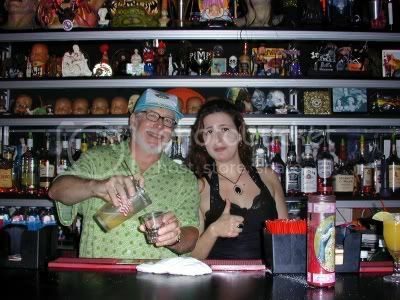 Even though it isn’t a bar, I might post a few pictures so you can see what Bar Man does on his off days. Mostly drink and party. By the way, all of these bars are on a short two block stretch of 14th Street between 1st and Avenue B so I didn’t include the specific addresses. Finding them is half the fun. Well, not exactly nowhere, not anymore at least. This was a bit of a desolate stretch back in the day and there still isn’t a lot of action here. 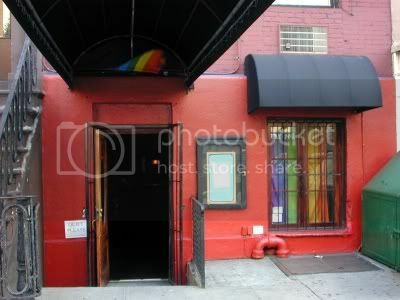 Nowhere has only been around for two years and it is a “Gay Friendly” bar but not exclusively gay. Now that the gay scene has become somewhat of the in scene most gay bars are pretty mixed these days. One thing that they do tend to have in common though is that they are dark, very very dark. So dark that I couldn’t even see to write so my notes are a bit sketchy. The place has a bit of a rustic look to it, rough brick walls and a bar back that is made out of rough hewn wood. The bar was dark wood and there were two beer stations with eight spigots that served up a credible selection of beers. I was only going to get a glass of beer but the bartender said he could only sell me two half-pints instead of a pint. I guess that would be so I could split a pint with someone. I opted for a pint. There were two fireplaces in here and they looked like they might be operational in the winter. A single orange globe light was mounted above each of them. A lounge area in the back with a red drape over the entryway looked like it could afford more, shall we say, intimate seating. Lots of small about the place and the walls and there were also ledges with stools for additional seating and places to put your drinks. A silver disco ball hung over a small DJ stand. A string of small orange lights was strong along the wall opposite the bar. There was a small enclave with a Terminator pinball machine and a Ms. Pac Man machine. There was also a pool table with red felt. What is wrong with the traditional green? 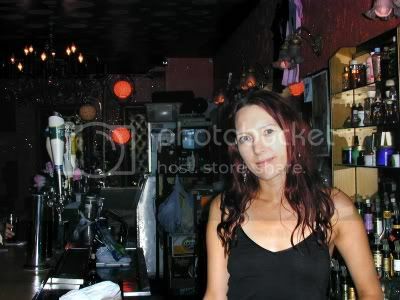 The bartender was a friendly, well tattooed fellow who served up a dish of pretzels. He gave the Mysterious Chinese Lady, who accompanied me, a glass of water because he said it just wasn’t right to sit at a bar and not drink something. I had a pint of Sam Adams Summer Ale. 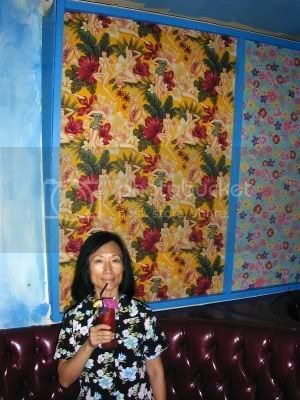 from the red, yellow, and blue illuminated blowfish (plastic though) over the tan Formica topped bar with a bamboo front to the colorful wallpaper featuring 50’s era bathing beauties and flowers. The barstools were black iron rods with fake leopard-skin seats. 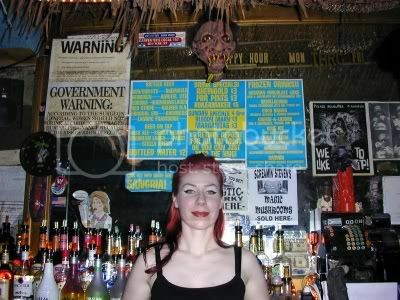 Of course there is also the requisite shrunken head hanging over the bar along with a lot of Tiki masks. Behind the bar is just a large mirror covered with drink specials and what-not. Lots of Tiki stuff and, of course, a wide assortment of funny glasses to serve the wide assortment of drinks with funny names. 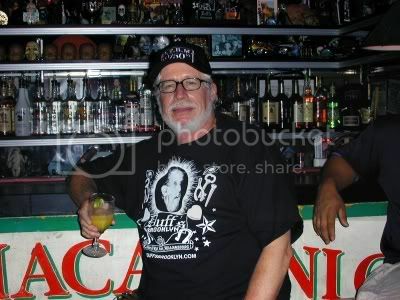 Two guys were sitting at one end of the bar when I arrived and the bartender was making a drink to their specifications that seemed to call for an inordinate amount of 151 proof rum. They were pretty bombed when I arrived and during my stay one guy had at least four more different drinks and was attempting to steal each of the glasses. Whether the bartender let him get away with it or was going to retrieve them before he left I don’t know. He certainly wasn’t fooling anyone though. 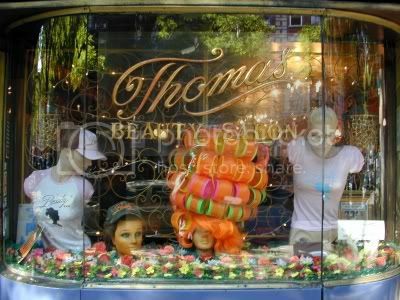 Hell, she was so pretty I had to take two pictures, and this time I got Otto's Shrunken Head in the shot too. The walls that weren’t covered with wallpaper was covered with kind of a woven bamboo or, in the front, murals of tropical scenery. The wall opposite the bar was lined with deep red banquettes, each of which had a small round table and a single chair in front of it. There was a “Believe It Or Not” pinball machine, a photo booth, and somewhat incongruously, a Big Buck Hunter machine. Thought they would at least have one where you could shoot zombies. In the back was an area with a stage and a drum kit so I guess later in the night there would be live music. The stuff being played wasn't bad though and it all had kind of a dark, zombie like theme to it. The Mysterious Chinese Woman had a Singapore Sling that seemed to give her more of a sugar rush than anything and I had the requisite Zombie. We ambled out of here and had dinner at one of my favorite restaurants, Capucine’s, where I had a couple of Bombay martinis and two after dinner Stregas with a double espresso. Well, being buzzed and on a caffeine and sugar high never stopped Bar Man from completing his appointed rounds so after dinner I back-tracked a bit to this former beauty parlor for my last stop of the night. I was a bit too sloshed to take notes and between downing another couple of beers and chatting up the bartender, Lara, and getting suggestions for places to visit in the future the Mysterious Chinese Woman took over the task of taking notes. There is a blue ceiling with white bubbles painted on it. Blue and orange globe lights were at one end of the bar and two crystal chandeliers hang over the bar. One was off and the other had only half of the lights on. The walls are orange with sparkles embedded in them. A couple of pictures of women with elaborate hairdos hang on the wall, maybe Patti Paige and a young Jane Fonda (not really sure though). Antique hair dryers line the wall opposite the bar and they now have lights in them. Chairs sit under them and, of course, people have to sit on them with their heads in the lights. Kind of strange seeing a guy with a drink in his hand sitting under a hair dryer. Well, maybe not all that strange. The floor is black and white checks and there are vases of flowers on the wooden topped bar that had a Formica front. On the shelf above the liquor are a wide variety of beauty products are on display. The liquor sits in front of a large mirror. I had a couple of draft Bass Ales and then we headed off to the subway home. A fine evening and mission accomplished. Three bars hit, a great dinner, on track for number 750 on Saturday. Life is good. Well, I didn’t really go to the Theatre, I just spent some time in the Theatre District and stopped at one quintessential before and after the theatre hang-out and one new place in Schubert Alley, and it doesn’t get much more theatre than that. Has anyone not heard of this place? 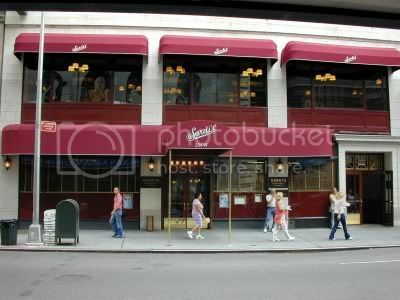 It is located at 234 West 44th Street and has been around for over eighty years. There is a larger bar in the restaurant itself but I went to the more intimate Little Bar. Why Bar Man wanted an intimate bar at 3:00 P.M. in the afternoon is unsure, but it seemed like a nice place to pop into. The Little Bar is, no surprise, little. It is in an anteroom to the larger restaurant and quite separate. Just five wood chairs with oxblood leather seats and back around the dark wooden bar that had a black foot rest. There is a large mirror behind the bar with glass shelves holding glasses. Two tiers of shelves hold the most popular liquor and two cabinets below hold their most popular liquors and two cabinets below hold the backup supply. In the center, below, are two metal coolers. Four martini glasses filled with ice were chilling on the bar and Bar Man was sorely tempted. 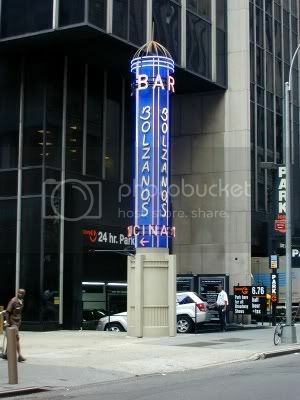 I think if I am in the area and really want a martini this might be the place to get it. They also had decent snacks on the bar, peanuts, pretzels, and a crock of soft cheese with crackers. Narrow ledges with chairs in front circle the room and there is one round table with a black and white marble top and four chairs sitting in the middle of the room. That pretty much takes up all of the available space. The windows have dark Venetian blinds giving the place a kind of private library feel (at least the kind of private library I would like). All available wall space is pretty much covered with caricatures of actors and miniature playbills. There was a television sitting on a highboy to the left of the bar but it was off. 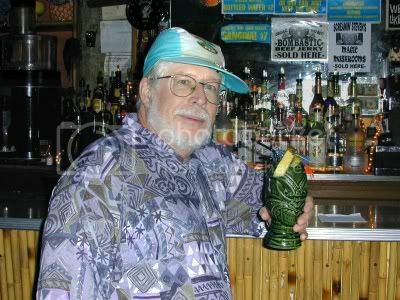 There was a gentleman at the bar having a cocktail and we got to talking about sports. 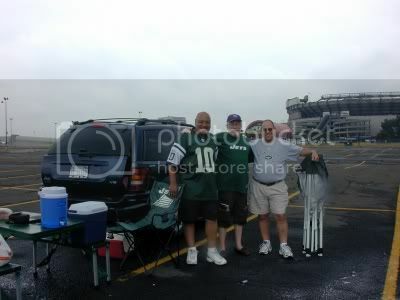 He is a Giants fan and I am a Jets fan. The conversation had more to do with old outdoor stadiums (we both like them) and newer indoor stadiums (neither of us like them) and the old days. The older you get the more of those days you have to talk about. Why I remember when…, oh, never mind. I had a bottle of Guinness, one of the regular bottles, not one of the foaming kind. The somewhat, shall we say phallic sign drew me into this place right across from the Booth Theatre. It is obviously new and very elegant. The bar has a light tan marble topped bar with a light wood front and a dark marble foot rest. Both the small overhang of the bar and the foot rest had little lights under them. The ones under the foot rest reflected off the greenish marble tiles that ringed the bar and an area with a tiled floor with a somewhat woven pattern. The rest of the flooring was wood. There were little artificial plants that looked like some kind of herb (not the smoking kind) in clay pots sitting on the bar. Much larger, more ominous looking plants sat in black pots on each end of the bar. The bar chairs were luxurious, light wood but very soft with creamy leather seats and backs. There were also little bowls of olives on the bar for snacking. 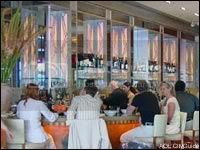 The bar back had clean lines with six tall mirrors separated by marbled mirrored columns that had orange glass panels with metal designs and that were lit from within. Glass shelves in front of the mirrors held glasses, bottles of wine, and a small collection of grappa in elegant bottles. Underneath the glass shelves were tiers of shelves holding more liquor. Below that were cabinets and shelves. Elaborate lights hang from the high ceiling. They were large rectangular box that were textured tan glass and the were inside clear, but somewhat mottled, boxes that were about half the height. The lights were of two basic sizes, short and squat and taller and narrower. There were a lot of plants in here and large French doors and windows look out over the outside seating area and provide a glimpse of the people passing by. The whole place has a light airy look to it and the buzz is that the food is excellent. I had a Tanqueray and tonic and called it a day. A short day, but a nice day. Just hit two for 746 for the year and only 3 more before number 750. I will hit those tomorrow and take Thursday and Friday off (Jets game on Friday). I now have 254 to go for the year. I headed back to Hell’s Kitchen and it was a lot cooler than the last time, thank goodness for that. Only downside was a wee bit of drizzle the merely served as an excuse to stop in one additional place on the way home. 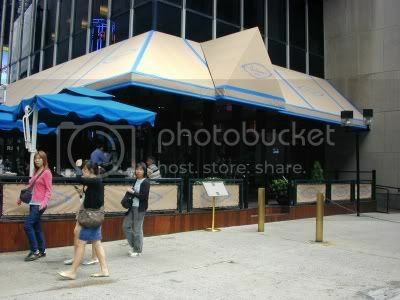 Located on the corner of 44th Street and 11th Avenue is this surprisingly pleasant place despite, the suspect looking exterior and, shall we say, interesting location. The bar has a nice inlaid wood top and a paneled front with a silver foot rail. The top is definitely new but the lower part looks old. The black metal chairs with green vinyl seats and backs also look like they have seen better days. The upper shelves and cabinets behind the bar look new as well, as does most everything in here. There are four cabinets with glass paned doors with orange diamonds of stained glass. One door of one cabinet was plastered with union patches. The shelves below as well as the cabinets themselves hold liquor and there is one of those little islands for dispensing shots of booze. Two small flat-screen televisions sit on two shelves above the bottles. The setup below, metal coolers and a couple of wooden cabinets with stained glass doors looks much older and is probably what is left of the original furnishings. The overhang above the bar has recessed spot lights and a brass rack from which glasses hung. The walls have new looking paneling about a third of the way up and the walls are deep rose above that. Stained glass shaded lamps hang from the patterned, tarnished silver colored ceilings. Little lamps with fringed shades hang on the walls over the tables against the wall opposite the bar. There is a partition with a brass rail on top that separates the dining area from the bar and there are tables along the far side of that as well. The front wall and the wall opposite the bar have windows with small wood panes. There are pictures and photos of landscapes on the walls and two framed Irish emblems, one was a gold harp, on green backgrounds. The back wall also has a larger television and on the other side of the entryway to the kitchen and the restroom were two clocks, one shaped like s ship’s wheel. There are enough Irish themed knick knacks in the cabinets behind the bar to give you a feel for what this place might have been like before the renovations. 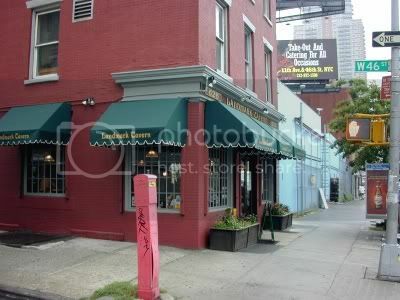 At 626 11th Avenue, at the corner of 46th Street is this old, really old, tavern. 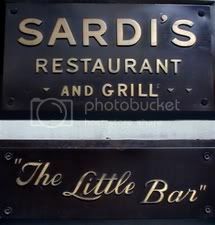 I was told that it is the fourth oldest drinking establishment, about 130 years old, in New York and has been in continual operation since it first opened, at least up until just recently when it was closed prior to being purchased by the owner of Druids. 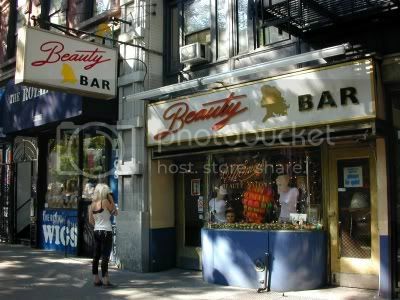 It is one of the classic old bars in New York where some care has obviously been given to maintaining its appearance. The top of the bar has been refurnished many times but it is certainly old with an ornately carved front and a brass rail. The bar chairs do look new, however; wood with soft black leather-like vinyl seats. 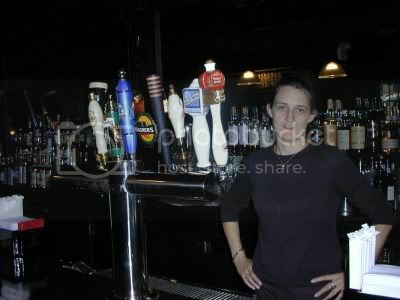 A silver T shaped beer station sits on top of the bar and it has eight spigots. The bar back is a combination of ornately carved wood and large glass mirrors. Small globe lights are mounted on the narrow columns separating the mirrors. Tiered shelves hold the liquor and glasses sit or are stacked on white linen. A cabinet with sliding cut glass doors sits below along with coolers and cabinets with wood doors and brass hinges and handles. There are windows on two sides so not a lot of room for much of anything on the walls except a couple of narrow mirrors and a few more small globe lights. A low partition immediately opposite the bar separates it from two rows of tables for dining. There is also a larger dining area in the back. Immediately behind the bar chairs is a row of rippled glass shaded lights hanging from the brown patterned tin ceiling. The restrooms, that were most likely added later in the game (did they even have indoor plumbing 130 years ago? ), are built into what kind of looks like a cobbled together room with stained glass on the top and, for some reason, a marble column with a gold top in the men’s room. I am not sure what was in the woman’s room. I had a draft Blue Moon, a Belgian style wheat beer. 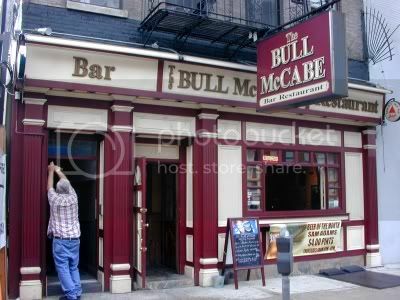 This is not the same as Bull McCabe’s which is located on 8th Street, no relationship at all except, perhaps, in the courts where there was some attempt by The Bull McCabe to prevent the other place from naming itself Bull McCabe’s. Got that straight? Then don’t go down to the bathroom in The Bull McCabe because on the way down the steps you will see a mirror with Bull McCabe’s on it (the beer distributor probably delivered it to the wrong place). 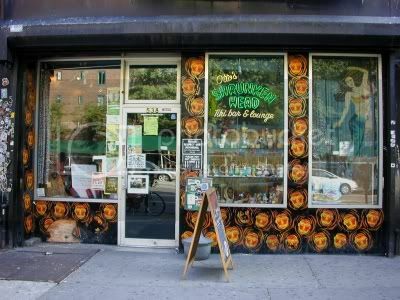 It is located at 714 11th Avenue, between 50th and 51st Streets. An old wood topped bar with a brick front and a brass rail. Plain wooden chairs. The wall behind the bar is kind of a pale yellow distressed brick. There are two small wooden cabinets with small drawers below them behind the bar. Tiered shelves hold the liquor and below those are wooden cabinets and a black metal ice chest. The place has kind of a rustic early Americana look to it that I found a bit peculiar. Only peculiar because “The Bull” McCabe was a character in a play by John B. Keane, ‘The Field,’ that was based upon a true story about a conflict over land which occurred in Kerry, Ireland. The play was made into a movie that was released in 1991 and Richard Harris played “The Bull” McCabe. But I digress. It had started to drizzle and, believe it or not, once I got damp I got a bit chilly so I had a well constructed Makers Mark Manhattan. 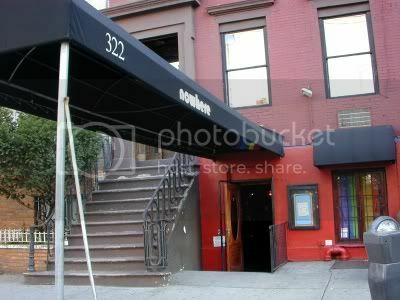 At 369 West 40th Street on the corner of 9th Avenue is this Spanish Tapas bar. 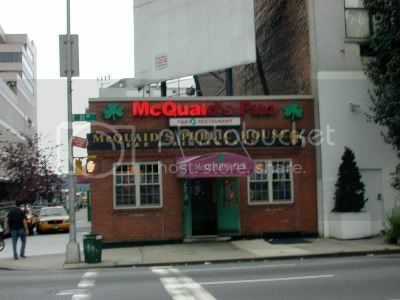 It was a long walk to the Subway from The Bull McCabe (believe me, 11th Avenue is a long walk from just about anywhere) and I was still a wee bit damp and Bar Man had to take a whiz. Plus I thought having a glass of wine here would be good conditioning for my trip to Spain that is coming up in October. 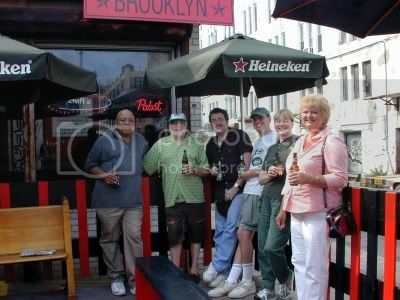 There is a red-topped bar over a light wood paneled front with a foot rest with a black and white chip design. There are somewhat ornate black metal bar chairs with brown vinyl seats. The bar back is light wood with five arches over mirrors. Small shelves in front of three of them hold liquor including a bottle of the elusive Johnny Walker Blue Label. They also had a bottle of the even more difficult to find (but not as expensive) Green Label. The other two mirrors had tiered shelves holding a good selection of liquor and even more is stored underneath, and they have some very interesting stuff. There is more to this place than initially meets the eye. 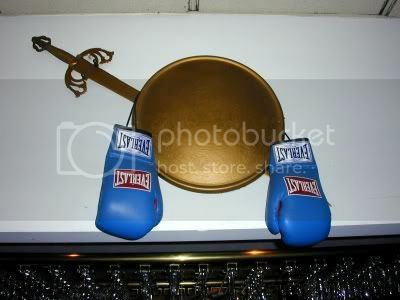 There is an upright piano at one end of the bar and a pair of blue boxing gloves, along with crockery, hanging above the bar. Nobody could explain the significance of the boxing gloves. Most of the staff were enjoying their afternoon meal and watching a cooking show on the television. I had a glass of Pinot Grigio and headed on home. A good day with four bars hit making 744 for the year and leaving 256 to go. Only five more before the big 750 on Saturday at Duff's. I am going to spend some time double checking my numbers. I would hate to think I made a mistake and am one off.